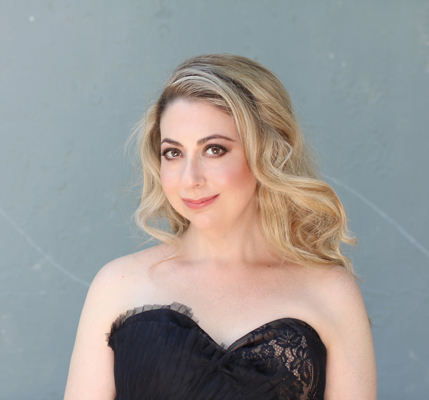 Erica Strauss, an alumna of the Lyric Opera Center for American Artists (now known as the Ryan Opera Center) made her Lyric Opera of Chicago debut in 2004 as the Priestess in Aida under the baton of Sir Andrew Davis. She has since been seen there as Erste Dame in Die Zauberflöte, Micaëla in Carmen and Marianne Leitmetzerin in Der Rosenkavalier. While a member of the Lyric Opera Center Ensemble she performed numerous roles including Rosalinda in Die Fledermaus, Donna Anna in Don Giovanni, and Nella in Gianni Schicchi and was responsible for the roles of Candace in the world premiere of William Bolcom’s opera A Wedding, Freia in Das Rheingold and Gerhilde in Die Walküre. She has also appeared at the Metropolitan Opera as Marianne Leitmetzerin in Der Rosenkavalier Other notable engagements include Sarasota Opera as Gilda in Rigoletto, her debut with the Cleveland Orchestra as Marianne Leitmetzerin conducted by Franz Welser-Möst, and a return to Chicago for the cover of Leonora in Il Trovatore conducted by Bruno Bartoletti. In Europe, she performed Rosina in Giovanni Paisiello’s Il Barbiere di Siviglia at the Théâtre National d’Evreux. Ms. Strauss has returned to the Metropolitan Opera as Anna in Nabucco and to the Lyric Opera of Chicago for their production of Die Zauberflöte, Opera New Jersey as Leonora in Il Trovatore, and Cedar Rapids Opera and Opera New Jersey as Mimi in La Boheme. An accomplished recital artist, Ms. Strauss has been associated with the Marilyn Horne Foundation since 2005 and has been presented in numerous recitals under their auspices including an On Wings of Song recital series in New York, and made her Weill Hall debut in a concert presented under the auspices of the Gerda Lissner Foundation. She has also led residencies and recitals at both Oberlin College and the Cleveland Art Song Festival, the Santa Barbara Museum of Art and at Zankel Hall as a performer in Miss Horne’s The Song Continues…birthday gala concert at Carnegie Hall. Many of these performances were broadcast in New York on WQXR, and nationally through WFMT. In 2007 Erica joined Marilyn Horne for a broadcast of Saint Paul Sunday on National Public Radio, singing pieces from her various recitals and being interviewed by host Bill McGlaughlin. She also performed a recital and worked with students at California State University Channel Islands and appeared in recital with the Pro Musica Detroit concert series. On the concert stage, she appeared as Soprano Soloist in Verdi’s Messa da Requiem with both the Tulsa Oratorio Chorus and the Santa Barbara Choral Society, a concert of excerpts from Dvorak’s Rusalka with the Green Bay Symphony Orchestra, as Soprano Soloist in Beethoven’s Symphony no. 9 with the Chicago Philharmonic, as Micaëla in Carmen with the Northwest Indiana Philharmonic, soprano soloist in Lyric Opera of Chicago’s Rising Stars in Concert under the batons of both Sir Andrew Davis and Valery Ryvkin, and Sarasota Opera’s annual Verdi Concert. A native of New York, Erica received her training at Mannes College of Music and holds both Bachelor’s and Master’s degrees from the school. In addition to her time at the Lyric Opera Center for American Artists, Erica is an alumna of Music Academy of the West and has been a member of both the Sarasota Opera Apprentice and Studio Artist programs. Erica is the recipient of numerous prestigious honors and awards including First Prize in the 2009 Gerda Lissner Foundation competition, a 2008 Sullivan Foundation award, a Richard F. Gold Career Grant and awards from the Marilyn Horne Foundation, Liederkranz Foundation, Metropolitan Opera National Council, Jose Iturbi International Music Competition, Opera Index, American Opera Society of Chicago and The Musicians Club of Women.